Barbados was divine. 太太 was generously entertained at uber exclusive private villa that Mariah Carey stayed in the week before. Simon Cowell leased the same place for $1 million over Christmas. 20 full-time staff keep the place going. Gobsmacked! Swam with giant turtles and had the whole Carribean Sea to ourselves. Some pictures arrived from talented photographer-guest from New York. Introduced to an intimate group of international decision makers on this trip including the Vice-Chair of the Global Heritage Foundation. Hoping Ivy will share with me details of the wine certification course...so i can study up and be part of the conversation next trip. Some of these residents have amassed a handsome collection of impressive wines and libations in this neck of the woods. Here are some of the impressive wines that Aj shared with us. The 1978 Petrus was ok. 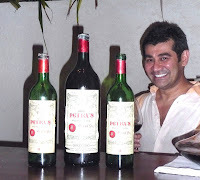 The magnum of 1985 Petrus was much better. Doesn't he look happy & super fit? Twice he had us over to his palatial villa. Jean-Georges, the creator of Market at Shangri-La arrived with his wife and daughter. US ambassador who has recently joined the Temasek - GIC board and B.S. Ong and his stylish entrepreneur wife Christina also joined the crowd. This is a storybook life. 太太 so privileged to be a guest. This is a glimpse into the world of comfort and ease. But then these people work at a fast and hard pace so they also play hard too. What a great place to practise yoga! Total serenity. Tina, i'm almost ready for that walk with you. Have a few loose ends to take care so we can connect before summer ends and 太太 returns to San Francisco for more yoga training and connecting with new friends. More again soon.